Rant: Wines Over 100 Points? Famed wine reviewer, James Sackless, has declared that the 2016 Hi-alk Winery Napa Valley Cabernet Sauvignon has been awarded 103 points. How is that possible with a 100 point wine scoring system? There may now be a precedent which some wine reviewer could potentially use to start giving out 100+ points. That is a scary scenario. Consumer Reports recently released their review of the all-wheel-drive Tesla Model S P85D sedan and stated that it broke their ratings systen. "The Tesla initially scored 103 in the Consumer Reports‘ Ratings system, which by definition doesn’t go past 100. The car set a new benchmark, so we had to make changes to our scoring to account for it." Could this be a sign of the future, that 100 point ratings systems may be inadequate? Some wine magazines and reviewers use a 100 point scoring system for wine and it seems that those wine scores have generally been getting higher with time, that more and more wines are scoring in the 90s and more wines are being awarded 100 points too. As these scores continue to creep up, it isn't that hard to believe that some reviewer would like to award a wine more than 100 points, to set a new benchmark for what is seen as a quality wine. And the Tesla case could be used as a precedent to do so. Though the Tesla is an auto and not a bottle of wine, they both still use 100 point rating systems so there is some similarity. The battle over the use of wine scores continues to rage on in the wine world. The rating system isn't going away any time soon, though it seems the number of people relying on wine scores is decreasing. Wine lovers are relying on alternatives, on the recommendations of trusted peers, wine shop staff, wine bloggers, and others. I won't go into all the arguments for and against wine scores, but the key here is wine scores have been losing credibility in some circles and that will continue, especially if a few reviewers start pushing for 100+ scores. Consumers are better off without wine scores. It is never a guarantee that you will enjoy a wine. Instead, relyon your own taste, and those people you trust who have a similar palate. Experiment and broaden your tasting horizons, seeking out new wines as you never know where you might find a new favorite. With so many thousands of wines out there, opportunities for tasting are everywhere and you should take advantage whenever you can. And if in the near future a wine receives a score over 100 points, it could be a sign of the wine apocalypse. After a fine lunch at Anju Noodle Bar, I made a couple quick stops to two other food businesses in the Foreside neightborhood. I really need to spend more time in this area, lingering at these two and the other food businesses. I suspect that this neighborhood will only continue to grow and prosper, adding other independent businesses and enhancing the appeal of the area. source their animals only from farms within 100 miles of Kittery. In addition, they focus on humanely, naturally raised animals, with no use of hormones or antibiotics. Their beef may be pasture raised or grass fed, and some is organic as well. Here is a list of some of the farms they use, and you can also find a blackboard at the shop which lists the current farms. Besides meat, they also sell fresh produce, wine, beer, some pre-packaged foods and more. The meat looked very good, ranging from various cuts of beef to sausages, lamb to pork, chicken and ducks. If you desire a certain cut that you don't see, you just have to ask. And they also can provide recipes if you so desire. Their deli has plenty of charcuterie and cheese, including homemade roast beef, kielbasa, and Italian truffled ricotta. They make about 30 sandwiches a day, the type changing day to day, and once they sell out, there are no more for the day. I bought some Sirloin Tenders, which were sourced from PT Farm, in North Haverhill, NH, and marinated them in my own homemade Garlic Teriyaki sauce. I then grilled them and they came out quite well. The meat was tender and flavorful, lean and juicy. If this is an example of the quality of all of the meat at MEat, then it is well worth visiting this shop. After visting MEat, we made a quick stop at Lil's Cafe, which serves breakfast and lunch every day. They also make all of their own pastries and bread on premises. In addition, they have a variety of coffees and teas, including fresh brewed iced tea. Dan Ford recommended that I try one of their Crullers ($2.35), which looked like a glazed and grooved cake donut. However, I was pleasantly surprised when I really it was actually light and flaky, more like French Cruller. The exterior is sweet and crusty, almost like fried dough, while the interior is flaky (like a croissant) and eggy (like the interior of a popover). Despite being fairly full from lunch, I still was able to devour this cruller because it was so damn good. This is an addictive treat and I understand why they are so popular. Next time I visit Lil's Cafe, I'll bring several home with me, as well as try some of their other baked goods, like their Cinnamon Rolls or Monkey Bread. Get to Kittery and explore the Foreside neightborhood. It seems many people think Kittery, Maine, is just about the discount outlets. Sure, the outlets can be fun for shopping, however the culinary options are lacking in many respects. You'll mostly find chains like McDonalds, Burger King, and the Weathervane. Bob's Clam Hut is one of the exceptions and a good option. However, there is more to Kittery than the outlets and you would benefit from exploring other areas of Kittery, including the Foreside neightborhood. The Foreside neighborhood is located across the water from Portsmouth, New Hampshire, and it has become a small area dedicated to music, arts and cool food spots. Earlier this week, I visited Dan Ford of the Blue Current Brewery, a new Sake brewery in Kittery, and he introduced me to a few of the food options in the Foreside area. I was impressed and will be returning again in the near future to explore more of the culinary offerings. Food lovers need to put Kittery Foreside on their radar. We began our exploration by having lunch at the Anju Noodle Bar, which is owned by Gary Kim and Julian Armstrong. The term "Anju" is a Korean word which roughly translates as food intended to be consumed with alcohol. The concept seems similar to a Japanese izakaya, Anju is open for lunch and dinner every day except Mondays. It is a small restaurant, with about 38 seats, including a counter area and a small number of tables. It has an intimate vibe and was fairly busy on a mid-afternoon Tuesday. I can easily see this place being packed at night, especially on weekends. I got to meet one of the owners, Gary Kim, who has worked at previous restaurants including Pesce in Portsmouth and The Black Birch in Kittery. His partner, Julian Armstrong, has also previously worked in a number other restaurants and has also been involved in wine sales. In 2013, they opened Son-Mat Foods, a company to make Korean kimchi and other similar products, and then in 2014, they opened Anju Noodle Bar, They have garnered some well deserved raves though it is clear that more people need to know about this interesting and delicious restaurant. We sat at the counter and it overlooks both the bar and tiny kitchen, so you can watch the chefs preparing your dishes and marvel at how they accomplish so much in such a small space. They make their own kimchi and hot sauce. Their Menu was divided into Small Plates ($6-$12), Medium ($9-$11), and Mains ($13-$18). It is an eclectic menu in some respects, as you'll find dishes including Meat Balls and XO Roasted Corn alongside more traditional Asian dishes such as Okonomiyaki, Ramen and Shrimp Toast. You can also get sides of different Kimchi ($4). I found plenty of the menu which appealed to me, ending up selecting three dishes to sample. The Pork Bun ($6) is made with cucumber, pickled red onion, hoisin, and kimchi mayo. As you can see, the bun is packed full, and included a large, tender rectangle of pork. It was a tasty blend of textures and flavors, sweet and salty. The bun was soft and slightly chewy and it was a good value for the price. If you don't want meat, you could instead try their Eggplant Bun. The Rice Cakes ($11) are made with onigiri. 5-spice duck confit. and dragon sauce. It is an ample dish with lots of tender, flavorful duck, some crunchy rice, and an intriguing sauce that added a little spicy heat. There were some unknown veggies in the dish, which I didn't ask about, but they only added some flavor and texture to the dish. It earns a hearty recommendation. The Shoyu Ramen ($13) is made with MEat bone broth. tare. slow-roasted pork shoulder. ajitama soy egg. and nori. The bones comes from MEat, the butcher shop next door which sources animals from local farms, and their noodles come from Sun Noodle. I was impressed with the depth of flavors in the broth, which was salty and tangy, with a strong umami element. It was well balanced, so that no flavor overwhelmed the others, instead working together in harmony. The noodles were thin and chewy, just the right texture, while the egg was soft with that wonderful gooey yolk. There were plenty of pieces of tender pork and the entirety of the dish was satisfying on several levels. Damn tasty ramen and highly recommended. For drinks, you can get Wine, Beer, Cider or Sake. Their wine list has plenty of interesting choices which should appeal to wine lovers. A number of their beers are local to New England though there are some unique brews from elsewhere too. They have seven Sakes available by the glass or bottle. With our lunch, we enjoyed some Blue Current Junmai Ginjo Sake, which is available by the glass ($8) or 375ml bottle ($30). I will be posting a full article about this brewery next week, but I will say that it made an excellent accompaniment to the food. It is the type of Sake which I can sit and drink all afternoon. I was thoroughly impressed with the cuisine at Anju, feeling it is a good value for the quality and quantity of food you receive. The dishes are well composed, with balanced and complex flavors. They have a very good drinks program and it is a fun atmosphere. I definitely will return here to try more items on the menu and it earns my highest recommendation. Check out the Kittery Foreside neighborhood and sample the bounty that can be found. 1) What began as a supper club run out of husband/wife team Tse Wei Lim and Diana Kudayarova’s Somerville apartment later became Journeyman, an intimate, almost naked dining experience in Union Square that turns five this month. Marking the milestone will be a week-long throwback menu highlighting some of the top dishes from the restaurant’s first five years. The anniversary celebrates the restaurant’s journey while also nodding to the transformation of its Union Square home. Though now a serious stomping ground for established local chefs and food/drink enthusiasts, Union Square wasn’t always a polished dining destination or even one with much personality at all. When Journeyman opened in 2010, Tse Wei and Diana recognized that the neighborhood was on the cusp of something big. From their perch on a quiet side street off Union Square’s main drag, they now have a front-row seat to the continued development that they helped catalyze. INFO: For more information, call 617-718-2333. 2) On Tuesday, September 15, at 6pm, Legal Harborside will host a special burgundy seminar and wine dinner with Maison Bichot, ideal for Burgundy collectors and aficionados. Since its inception in 1350, the family-owned winery which has been passed down over generations has created some of the greatest wines in the world. Bichot’s label encompasses four separate vineyards located at the heart of the four major wine regions in France that create Burgundy: Chablis, Côte de Nuits, Côte de Beaune and Côte Chalonnaise. Each vineyard is dedicated to the vinification and aging of each wine’s structure and character and each wine represents the essence of their expertise and style. Legal Sea Foods will team up with Guillaume Suss, to host an exclusive seminar and five-plus-course dinner featuring signature cuisine paired with selections from the Maison Bichot vine. 3) Papa Razzi Metro, in Burlington, is launching a brand new brunch menu. Guests can now enjoy a variety of freshly-squeezed juices and a selection of top caffe while dining on brunch items designed to satisfy every palate.Whether sipping on a Special Roast Illy Blend Coffee while catching up on the morning news or enjoying a bountiful brunch with your closest family and friends, Papa Razzi Metro offers an opportunity to enjoy a delicious, Italian meal in a casual yet exciting atmosphere. WHEN: Brunch is now available every Saturday and Sunday from 11:30 a.m.to 3p.m. 4) This Saturday night, August 29, from 5pm-11pm, head up to downtown Portsmouth, NH, for the Vida Cantina Pop Up at Moxy. Dave Vargas, Chef/Owner of Vida Cantina, is taking over the Moxy restaurant and kitchen for one night only, cooking pop-up Tacos, Guac, Pigs Head Platters, and More. And they will be serving the signature Vida Margaritas too, with several tequilas available. A Ghost Chili Frosty? Now that sounds very intriguing., Skip the Kale Salad and go for a Belly Taco or a Pig Hed platter. I'm a huge fan of unsweetened iced tea, whether black or green, and I'm not alone. According to the Tea Association of the USA, the wholesale value of the U.S. tea industry is over $10 Billion and Americans annually consume over 3.6 Billion gallons of tea. Each day, over half the U.S. population drinks tea, though people in the South and Northeast consume the most. You might be surprised to learn that 85% of the tea consumed in America is iced. Despite the huge popularity of iced tea, too many restaurants seem oblivious to this fact. They seem to have fallen for the myth that iced tea is only a summer drink so once Labor Day arrives, iced tea vanishes from many restaurant menus. You'll still be able to get cold sodas, ice cream, and other cold items after Labor Day, but poor iced tea often gets banished until summer returns. That is simply wrong and needs to change. Iced tea is refreshing, thirst-quenching and the unsweetened version doesn't have the sugar content of sodas and other such drinks. It is also easy and very cheap to make so there is no reason why it shouldn't be available year round. At home, I have an iced tea maker and make it year round. In fact, I generally drink it every day, year round. PAUL Bakery, which has almost 600 locations around the world, is starting to make inroads into Massachusetts, with locations in Boston, Somerville and Burlington. They make excellent breads and pastries, all with a French flair. However, despite their quality products, I won't stop there too often because they fail in another area. I would like to dine there more often, but I'm not satisfied when I currently visit it. And it all has to do with iced tea. Though Paul offers iced tea, you generally can only get flavored iced teas. You can't get a simple black or green iced tea, unless it is decaffeinated. Why not? It makes no sense. You can get a simple, unflavored iced coffee but not iced tea. Its discriminatory to iced tea lovers and there isn't a valid reason to justify it. I don't drink coffee and don't want flavored iced tea, so if I go to PAUL, I end up with a bottled water and that isn't satisfying enough. I want a simple iced tea. Until PAUL starts offering a simple, unflavored iced tea, whether black or green, then I will patronize them only rarely. PAUL, it's you, not me. Are you listening? 1) Chef & Owner Brian Poe is rolling out an expanded brunch menu at CLUCKIT! in the South End. Beginning this Sunday, Chef Poe will be serving up more heat-filled piri-piri offerings and other classics on the corner of Tremont Street and Massachusetts Avenue. For starters, options include Zanzaipoe Pizza (goat cheese, peaches, mint, prosciutto, tandoori naan & arugula - $7.95); Calamari (piri lime sauce, honey glaze - $9.95); Wings (grilled - $9.95); House Salad (Bibb lettuce, avocado, mint, tomato, onion, cucumber, cumin, lemon yogurt dressing - $6.95); and the Portuguese-style Cassava Fries (molho cru mild dipping sauce - $4.95). CLUCKIT! also will offer a variety of side orders ($3.95 each) such as Cucumber Salad; Watermelon Salad; Black-Eyed Pea Salad; African Rice; Corn on the Cob; Piri Grilled Vegetables; and, Bacon. Chef Poe also is serving up nine signature brunch plates with selections like French Toast (molasses grilled banana, blackberry piri jam, whipped cream - $12.95); Breakfast Plate (cheesy scrambled or fried eggs & piri confit potatoes and toast - $11.95), Signature Omelette (mushroom, basil, cherry tomato, truffle & brie cheese - $12.95); Omelette (ham, bell pepper, American cheese, home fries, toast - $13); Chicken & Waffles (piri fried wings, apple maple butter & cranberry compote - $10); Ja-Nee Taco & Egg (piri braised chicken, mango slaw, roti & a fried egg - $6.95); Moons Over My Roti (ham, Velveeta, fried egg, roti - $6.95); Pork Belly (fried egg, spicy watermelon piri salsa, arugala - $10.95); Brunch Burger (classic Estelle’s burger, cheese, fried egg and fried onions - $13.95); and, Waffles (sundried cranberry gastrique - $10). CLUCKIT! is open for brunch from 11:00am to 2:30pm on Sundays. 2) “Happy Hour” is about to get even happier at Haru in the Back Bay. Beginning August 17, Haru will revamp its afternoon and late-night bar and lounge menu to include seven newcomers that are brimming with treasures from land and sea. Available for $8-and-under, Haru’s new offerings infuse Japanese culinary delights into a social bar experience and include Kushiage, skewers of flash fried shrimp and avocado with yuzu ponzu sauce ($6); Char Sui Pork Bun, a steamed bun with grilled pork belly, namasu, cabbage and cilantro ($6); the four-piece Yuga Roll, with spicy salmon, lemon and cucumber rolled in rice, sesame seeds and nori, topped with eel and massago and served with spicy mayo ($7); the soy-and-curry braised Tempura Short Rib, with romaine lettuce, herb salad and pickled onions ($8); a tender Chicken Satay, marinated in coconut curry with almond dipping sauce ($6); the spicy Wasabi Fritters, seasoned with Ichimi Togarashi flakes and infused with shiitake mushrooms, served with lemon dressing ($6); and slow-cooked Spare Ribs, marinated in lemongrass and chilies, grilled to perfection. 3) Chef Jacky Robert of Ma Maison Jacky Robert and a quartet of his well-known colleagues from the culinary community, will cook up a storm to raise funds for On Board For Kids, a charitable foundation that has donated close to $50,000 since 2012 to a trio of causes aimed at feeding hungry children in disaster-ridden foreign lands. The one-night event will take place on The Music City Queen, an authentic steam-driven paddleboat departing from the Rowes Wharf Ferry Terminal in Boston at 5:30 PM on Saturday, September 12 with a live jazz band on board. 4) Chef Brian Poe is introducing new dishes to the brunch menu at Bukowski Tavern in Cambridge. Beginning this Saturday, Chef Poe will be serving up classic comfort food and other favorites in the heart of Inman Square. For starters, “Hungover” options include Chips (homemade sweet potato chips, prosciutto, onion strings + green kosho tabasco - $8), Cauliflower (celery root, cauliflower chips, charred cauliflower, creamed kefir and onion - $6), Sweet Tater Tots (sage maple butter, French sea salt - $9), Fontina Bites (Prosciutto-wrapped fontina cheese, corn sauce - $9), and Grilled Corn (chipotle aioli, Cotija cheese, lime - $4.95). “Dainty” options will include the Grilled Caesar (parmesan toasted croutons, dressing - $11.95), Summer Salad (mixed greens, watermelon, strawberries, feta, roasted pistachios, dried cranberry champagne vinaigrette - $11.95) and, Heirloom Tomato Salad (heirloom beefsteak tomatoes, fresh mozzarella, basil, balsamic vinaigrette - $11.95). Poe also is serving up nine “Eggscessive” brunch plates with selections like the Buk Breakfast (scrambled eggs, bacon, toast - $10.95); Signature (basil pesto portabella, tomato, brie cheese, cherry tomatoes, truffle - $12.95); White Trash Cheese Chilequiles (flour tortillas casserole, white trash cheese dip, weenies, jalapenos, topped with fried egg - $12); Moons Over My Dilla (breakfast quesadilla stuffed with Velveeta, ham, fried egg, salsa fresca & Poe’s taco hell sauce - $10); Buk Burger (tomato, onion, pickle, lettuce, cheese, veal demi - $12.95; with an egg -$ 14.95); Avocado Burger (black beans, potatoes, black quinoa, cilantro lime crema - $12.95; with an egg - $14.95); and, Crab Cake Sandwich (poached egg, serrano chile- cilantro crab cake, mango hazelnut puree on a bun - $13.95). Bukowski Tavern is open for brunch service on Saturday and Sunday from 12:00pm until 2:30pm. Thirty-two Burgers battled for supremacy but only one could be named Champion. Who reigned supreme? Recently, Boston Magazine hosted the 4th Annual Battle of the Burger, a grand competition and homage to the ever-popular burger. Thirty-two restaurants and chefs competed, each offering their own unique take on the burger. You can check out the list of competitors and see which burgers sound appealing to you. I attended this event, as a media guest, tasting my way through 21 of the entries, carefully selecting which burgers to taste, before I was too full to taste any more burgers. I chose to leave some of the choices, like the vegetarian burgers, for the very end, in case I wasn't able to taste everything. The event was held at the Cruiseport Boston which made for a nice venue. The burger tasting tables were held outside, though beneath a ceiling which provided protection from the sun. There was also an area of wine bars, beer booths, Grillo's Pickles, and more which was inside, as well as another outside area, on the waterfront. It made for a festive atmosphere and though it got busy later in the evening, it still wasn't too crowded, which was partially due to how much space the event took up. I generally chose to drink a dry and pleasant Barton & Guestier Rosé wine with my burgers. Attendees got to vote for their favorite burger. which raised a few questions in my mind. Should the winner be the type of burger you would crave to eat once a week? Or should it be something more unique but which you wouldn't want to eat more than maybe twice a year? After pondering this for a time, I decided that a champion burger should be something you would savor on a regular basis. A one-trick pony burger might be exciting but it wouldn't satisfy in the long run. A champion should be able to stand the test of time,rather than be a single isolated incident. Most of the burgers that were served more mini-burgers, not full-sized ones. Preparing these smaller burgers presents different challenges than making larger-sized burgers. Should this actually be called a Mini-Burger Battle? Or should the chef have to prepare full-sized burgers and provide attendees pieces of each such burger? Does a mini-burger adequately show what a diner would enjoy at the restaurant if they ordered a normal sized burger? Last year's Battle of the Burger Champion was Chef Matt O’Neil of The Blue Ox in Lynn, making it his second Championship. His winning entry was the Sin Burger, made with USDA ‘Prime’ beef, Applewood smoked bacon, Swiss cheese, truffle aioli, lettuce, and tomato, served on a Brioche bun with a spicy Maitland Mountain Farm pickle. This year, Matt announced that this would be his last year as a competitor, Could we win for a third time? At the event, I thought that he would win again, based on the long lines at his table. No other competitor had anywhere near as long a line. People seem to know and love the Sin Burger, and I am a fan as well. In the end, my thoughts turned out to be correct and Matt became the Burger Champion for a third year, going out with a bang. Kudos to Matt and if you haven't dined at his restaurant, The Blue Ox, you definitely need to go. I now want to highlight two of my other favorite burgers, both which I think could become Champions next year. Let me preface this though by stating that though I enjoyed a number of burgers, my biggest complaint was that some of the burgers lacked balance. They generally had numerous ingredients and one or more of those ingredients overpowered the burger, so that you failed to appreciate the rest of the flavors. It might have been too much bun or a sauce or other ingredient that was too strong. It can be a delicate balancing act, to ensure all the ingredients contribute to the whole rather than become too dominant. Let me provide an example. The Living Room offered The Olympic Body burger, by Chef Frank Schattauer, which was a 8 oz. grilled Angus patty, Shaller & Weber Double Smoked Bacon, American cheese, and an over easy egg, served on a housemade maple, bourbon, and bacon glazed donuts. On its face, it is intriguing, a type of breakfast burger sandwich. Other restaurants have also created burgers using donuts as buns. It might not be something I would eat too often but as an occasional treat it might be fun. Unfortunately, for my palate, I felt that the maple flavor was too dominant and overpowered the rest of the sandwich. Without that maple, I might have enjoyed this burger much more. The burger, bacon and cheese were all tasty on their own, but got lost in all that maple. Onto my other top two winners. The first burger I tasted at the event ended up being one of my favorites. The Sweet & Salty Cow was made by Chefs Amy Butler and Thomas Holland from A&B Burgers in Salem. I have to note that they are moving their restaurant to Beverly around October. I really like the name of this burger, which was a grilled Black Angus burger with Buratta, bacon, fig jam and arugula on a Martin's Potato Roll. The juicy and flavorful burger was enhanced by the balanced sweetness and saltiness of the other ingredients. The burrata also added an additional creaminess which was a nice alternative to other types of cheese. Balance and great taste made this a winner. I was impressed enough that I now need to check out this restaurant to taste more of their burgers. My other favorite was from Precinct Kitchen & Bar who offered a simpler burger, the PK+B Burger created by Chef Olivier Senoussaoui. It showcased how quality ingredients can make simplicity absolutely delicious. In addition, they offered quarter slices of a normal-sized burger rather than individual mini-burgers. Their burger was made from dry aged beef, infrared seared and seasoned with hand harvested sea salt and freshly cracked peppercorn. It was then topped with Nueske's extra-thick cut bacon and Vermont aged cheddar cheese and served on a freshly baked brioche bun. From my first bite, which burst with flavor, I was enthralled with this simple burger. This is the type of burger I could easily eat every week, reveling in its taste. It wasn't a showy burger and didn't contain any strange ingredients, but it was very satisfying. What were your favorite burgers at the Battle? On their Brunch menu, Del Frisco's Grille, like a number of other restaurants, serves Southern Fried Chicken & Waffles. Yesterday, they posted a photo of this dish on their Facebook page. Generally, I'm a big fan of chicken & waffles but this picture disturbed me. It depicted a scene of waffle abuse though they are far from the only perpetrators of this type of abuse. Waffles are not the only victims. Pancakes too get abused in this way. Listen up chefs! Stop abusing waffles and pancakes by sprinkling powdered sugar on them. Powdered sugar, also known as confectioner's sugar, is simply a finely powdered sugar. Cooks dust this sugar on numerous items, from waffles to pancakes , cookies to brownies. It is partially a decoration but also adds sweetness to the food. It is overused and abused. It is added to far too many foods, creating more sweetness than is needed. There is little reason to turn breakfast into dessert. Many people add sweet syrup to their waffles, pancakes, or French toast so why do they need the added sweetness of powdered sugar? They don't. If you don't want the sweetness of syrup, you may not want the sweetness of powdered sugar either. So it seems silly that powdered sugar is a regular addition to pancakes, French toast or waffles. If anything, it should be optional, not the standard practice. You should have to ask for it to be added, rather than request that it be deleted. Most menus do not even mention that powdered sugar is added to these items. You don't find out that it will be on your plate until it arrives at your table. So if you don't see it on the menu, you can't assume that it won't be added. Adding powdered sugar to many dessert items also seems superfluous. It adds more sweetness than is needed for many dishes. Such heavy handedness with powdered sugar seems a cop out, the easiest fix for an amateur chef. If your dessert was perfectly sweetened, then there would be no need for powdered sugar. Your dessert, just like your breakfast items, should be able to stand on their own. Stop abusing powdered sugar. The waffle you save could be your own. 1) On August 20, from 6:30pm-11pm, Brass Union will christen their newly renovated outdoor patio by hosting a luau-themed celebration. Dubbed “Luau in the Square,” this summer soiree will transform Brass Union’s dueling al fresco areas into a Polynesian-style hideaway complete with tropical treats as well as festive torches, totem poles, lanterns and leis. From the bar, Beverage Director Paulo Pereira will feature handcrafted sips from Privateer (Ipswich, MA) including the Privateer Patio Punch (Privateer Silver, black tea, citrus, pineapple, sugar - $10), the Mamma Jamma (Privateer Amber, mango, citrus, allspice, cinnamon, orgeat - $12) and Bounce, Boogie & Bump (Privateer tiki-inspired gin, orange, cherry, pineapple, Benedictine, bitters, lime, soda - $12). Executive Chef Jonathan Kopacz will create Polynesian bites including Pork Cheek Skewers ($7) and Vegetarian Skewers ($6), in addition to dishing out fresh tortilla chips with a mild tomatillo salsa ($3). For additional luau entertainment, resident deejay Jeff Wallace will play the soothing sounds of the Hawaiian Islands and there will be a prize for whoever dons their best themed attire. Additionally, Brass Union will resurrect its patio games and there will be a custom photo booth with beachy décor to capture memories of this pop-up sanctuary in the heart of Union Square. Grab your hula skirt, leis and best Hawaiian shirts to help Brass Union celebrate summer in the city in a most festive way. COST: Complimentary admission. Food and beverage specials available at a la carte pricing. This event is reserved for ages 21+ with proper ID. Luau-themed attire encouraged. 2) Craft ramen with the works and hyper local inspired plates. Expect hand made ramen in ogusky ceramics, tasty plates + japanese whiskey and live blues. This is the 3rd Whisk Pop-up supper at their new home in JP. The space is moving ever forward as they build the restaurant and this is their way of sharing the ride. The Whisk team, chefs Jeremy Kean and Philip Kruta, are hosting their third Whisk At Fazenda pop up Supper Club event in their new Fazenda Café. The newest Pop Up will feature craft ramen with the works in Ogusky ceramics, other hyper local inspired tasty dishes, Japanese whiskey and live blues. Some dishes are shared and some are not. All items also available a la carte. WHEN: Thursday, August 20 &; Friday, August 21. Reservations starting at 6 PM to 11PM. 3) AKA Bistro is currently offering their own DineOut specials for the rest of the month, for both lunch and dinner. Lunch is $20.15 and Dinner is $33.15, Check out their 3 Course Lunch Menu, from Spicy Tuna Tartare to Fish Tempura. You cna also check out their 3 Course Dinner Menu, from Suzuki Ceviche to Sashimi Platter. I suspect the menu may change during different weeks, but I'm sure the menu items will all be compelling. This is always one of my favorite restaurant week experiences and I highly recommend you check it out. I know that I will be dining there at least a couple times. 4) Boston’s 7th Annual New England Dessert Showcase will take place on Saturday, September 19, from 12pm to 5:30pm. Visitors will sample indulgent, new dessert creations, old favorites and even some healthier dessert options from over twenty local exhibitors at the Westin Waterfront Hotel. General Admission, VIP and Private Tasting tickets are available. VIP ticket holders will receive admission to The Showcase, access to the Kickoff Party on Friday, September 18th and admission to the After Party following The Showcase. Private Tasting tickets include everything in the VIP package, all day admission, as well as early access to have an intimate private tasting with select exhibitors. Tickets are available for $30-$75 depending on ticket tier. Child tickets are available for $10-$15. General Admission tickets will be available at the door on a capacity only basis. Contact for group rates. The Kushala Sip Coffee House is now open in Stoneham, at 335 Main Street, across the the Town Common. Basically, it sells coffee, tea and other beverages, as well as baked goods and egg sandwiches. They have an outside patio and the inside is rather spacious and comfortable. There is plenty of parking in the area, and it would be a nice stop on Thursday afternoons if you visit the Stoneham Farmer's Market. Their baked goods come from two local bakeries, Swissbäkers (one of my favorites) and The Mad Cake Genius (and they have Finnegans). That is very good news and I like having a place so close where I can pick up a Berliner or Wegli. They serve various egg breakfast sandwiches, and I need to explore those further, to learn their origin too. There are three drink menus, including the Expresso which lists all the hot coffee options, in Small ($2-$3.55), Regular ($2.40-$4.35)or Large ($2.80-$4.65). There is a list of Frozen drinks, which include coffee and other drinks, such as Green Tea Matcha, Hot Chocolate Freeze and Fruit Smoothies. They come in Regular ($3.95-$4.55) and Large (%4.35-$4.495). Finally, there are the drinks Over Ice, including ice coffee,iced tea (organic), and Italian soda. There is plenty of variety, even for non-coffee lovers. I'll be making a few stops here in the near future and will report back my thoughts. For now though, I recommend you check it out. And if you do, let me know your thoughts. On Wednesday, August 12, Boston Magazine is hosting the 4th Annual Battle of the Burger, a grand competition and homage to the ever-popular burger. Thirty restaurants will compete, each offering their own unique take on the burger and you can see the list of participating restaurants and their creations here. You will get to taste items such as the Sweet & Salty Cow, the Cure, the Saltie Girl Burger, and the Ghost Burger. Participating restaurants range from Fuddruckers to Burger Dive, from Davio's to Tasty Burger. This special event will be held at the Cruiseport Boston at 1 Black Falcon Avenue. General Admission Tickets, which allow you entrance from 7pm-10pm and to sample all thirty burger, costs $95 and you can purchase tickets online. This event usually sells out so I suggest you buy tickets now or risk not being able to go. An important aspect of this competition is that you get to vote for your favorite burger and help determine the Burger Battle Champion. Last year's Champion was Chef Matt O’Neil of The Blue Ox in Lynn. Matt has won two prior championships and hopes to win a third time, and has already noted that this will be his last year of competition. Can he win this year with his Sin Burger? Last year's Runner Up was Chef David Forbes of Joe’s American Bar & Grill. Can he take First Place this year with his Cure Burger? Last year's 2nd Runner Up was Chef Nicholas Dixon of Lincoln Tavern and he hopes to win it this year with his Lincoln Slider. Or will some other Chef step forward for the win? I wish good luck to all the competitors. I will be attending this event so hope to see you there. I am curious as to which Burger I will select as my favorite. What will be your favorite? It is an artificial division, a tyranny of the plate. Fortunately, there are rebel restaurants which break from these stodgy traditions, refusing to kowtow to those who would refuse diners their desires. We need more such restaurants, especially as most Americans don't want to be bound by these silly restrictions. What am I talking about? Breakfast, served all day long. Bacon & eggs for lunch. A stack of pancakes for dinner. Waffles, omelettes, cereal, eggs benedict, and so much more, available whenever you desire. There is absolutely no reason why these foods shouldn't be available all day, They should not be delegated only to morning breakfast. Let us open our kitchens to all the possibilities, allowing people to have "breakfast" foods morning, noon and night. With so many people wanting breakfast all day, it seems like other restaurants should pay attention and starting offering a "breakfast" entree option on their lunch and dinner menus. For example, a pizza place could offer a pie topped with eggs, bacon, cheese and home fries. Or a restaurant could create a sandwich using pancakes or waffles as the "bread." A creative chef could concoct all sorts of compelling dishes using traditional breakfast foods. Give the people what they want, breakfast all day long. Do you have any favorite restaurants which serve "breakfast items" for lunch or dinner? For reservations, please call (617) 965-3100. 2) Beginning on August 3, enjoy the new Monday Market Menu at Davio’s Lynnfield every Monday evening during the month of August. In addition to their regular menu, the new three-course prix fixe menu will feature new items prepared by Executive Chef Danny Levesque, will utilize ingredients grown and available at the new Rooftop Farm at Whole Foods Market at Market Street in Lynnfield. This menu will change weekly based on the harvest. The rooftop farm is 17,000 square feet and was designed as ell as installed by Recover Green Roofs, a Somerville based company specializing in vegetated green roofs, living walls and rooftop farms. After Recover completed the design and construction of the rooftop farm, Green City Growers, also based in Somerville, assumed the responsibilities of harvesting and maintaining the crops. The estimated 10,000 pounds of fruits, vegetables and herbs are for sale in the market and used in their prepared foods department. It is the largest rooftop farm in New England and the first supermarket farm in the country. For Reservations, please call 781-944-4810. 3) Chef Carolyn Johnson of 80 Thoreau in Concord recently offered a special Striper Menu and I was impressed. She has a new special offering, a Corn & Tomato Tasting Menu, which uses local, fresh produce. Chef Johnson says "We are all about supporting our neighborhood farms, and farms like Brigham and Verrill really do grow the best corn and tomatoes you'll ever taste. August is the best time to be a chef in New England--the farm product is just extraordinary." The special menu will be available from August 4-15, and costs $45 person. And it sounds like it will be a delicious four-course dinner. 4) Newburyport is hosting the inaugural Savor Newburyport event brought to you by the Greater Newburyport Chamber of Commerce and their members, highlighting the cuisine, craft beer and cocktails, shopping and cultural experiences the maritime city has to offer. From September 17th through the 26th, Newburyport will host unique events and innovative dining and retail collaborations. The celebration will kick off on Thursday, September 17, at the Opening Savory Gala on Newburyport’s picturesque waterfront from 6-9pm. Guests will have the opportunity to sample award-winning food and drinks from over 30 local restaurants and chefs throughout Greater Newburyport. Throughout the 10-day celebration, tickets will be available to numerous special events hosted by local restaurants in and around Newburyport. In addition from Friday, September 18th to Sunday, September 20th, the Savory Retail Showcase events will take place with numerous retail shops offering special incentives, features and promotions. Simultaneously, the 10th annual Newburyport Documentary Film Festival will be held at the Firehouse Center for the Arts and the Screening Room, sharing the year’s most thoughtful filmmaking. Visit http://www.savornewburyport.com for event and ticket information. 5) Now that August is here, start off the month with some new food and fun experiences. Formaggio Kitchen provides a variety of fun-filled foodie classes that will please your palate this month. From oyster and wine pairings to creating the perfect summer clam bake, Formaggio Kitchen offers an experience to please everyone! Oysters and Old World Wines hosted on August 11th provides guests with five different ways to prepare this amazing bivalve accompanied by expertly paired old world wines. The Summer Clam Bake class on August 17th dives into this favorite New England pastime with James Beard nominated chef Matt Jennings of Townsman where guests can enjoy a classic clam bake that is expertly paired with beer, cider, and wine. On the other end of the food spectrum, Formaggio Kitchen's Pickling and Preserving 101 class on August 19th will show you how to save the fantastic flavors of summer produce with our in-house pickling enthusiast, Julie. Wash it all down with expert cheese and ciders pairings at our Cheese + Cider with Bantam Cider Company class on August 27th. Check out the Formaggio Kitchen website for more details. 6) Legal Sea Foods is holding their 7th annual Oyster Festival from September 17 through October 14, Legal Sea Foods venues in Massachusetts will feature a series of in-restaurant specials including Fried Oysters (three for $10) in four preparations: Buffalo Oyster (blue cheese, celery hearts, radish), BBQ Oyster (cole slaw, BBQ mayo), Sriracha Oyster (tasso, roasted corn, pickled green tomato) and Fried Oyster & Eggs (sauce gribiche, arugula, red onion). For Baked Oysters (three for $12), options include the Lobster Spinach Oyster (cheese, herbed crumbs), Oyster Scampi (shrimp garlic butter, white wine), Crab & Cheese Oyster (Jonah crab, horseradish, cheddar, cream cheese) and the Roasted Oyster (smoked chorizo butter, fresh herbs). There also is a Raw Oyster & Tuna Crudo (sambal, sesame dressing - $4.50), Raw Oyster (apple mignonette - $3). The official drink of this year’s Oyster Festival is the refreshing Deadrise (American Harvest Organic vodka, muddled cucumber, lime, grapefruit bitters - $10) designed to complement the oysters’ flavor profiles. Oysteria, Mamma Mia, a wine dinner for half-shell hedonists and novices alike at Legal Oysteria (October 7 at 6:30pm; $75 per person; 10 City Square, Charlestown). Have you ever enjoyed Pimpfish? You probably have tasted Pmpfish, but you likely know it by a different name, Striped Bass. It is also known by a number of other names, including Greenhead, Linesider, Rockfish, Squid-Hound, and Striper, It's been a popular fish since colonial days and is even the official state fish of Maryland, Rhode Island and South Carolina. I haven't been able to learn why it is allegedly referred to as Pimpfish, though there are tons of sources that mention it as an alternate name for striped bass. Last week, 80 Thoreau in Concord offered a special Striped Bass menu, a four-course dinner for only $55. Unfortunately, that special menu is no longer available though you likely can still get Striped Bass dishes at the restaurant. I was invited as a media guest to experience the Striped Bass dinner. I first experienced the cuisine of Chef Carolyn Johnson back in 2012, and was impressed. Based on my most recent experience, Chef Johnson is still presenting some amazing food. I dined there on a Wednesday evening and the restaurant was nearly full, a great sign especially during the summer when many restaurants have difficulty filling seats. I overheard a couple mention that they had only been able to get a 5:30pm reservation, showing the popularity of 80 Thoreau even during the middle of the week. I began the evening with a cocktail, the Naked & Famous ($11), which is made with Mezcal, Aperol, Chartreuse, & Lime. I love smoky Mezcal and not enough restaurants offer Mezcal cocktails. I enjoyed this drink, which was nicely balanced between sweet and bitter, with smoky accents. I'd later have a couple glasses of wine with dinner, including a Sicilian Grillo and French Rosé. Chef Johnson works with a number of local purveyors to source ingredients, from vegetables to mushrooms. The Striped Bass was sourced from Red's Best, which offers sustainable seafood and has an excellent traceability system. Striped Bass is generally a sustainable choice so it makes for a good addition on restaurant menus. Best of all, it's a tasty fish, which is versatile in the kitchen, and Chef Johnson emphasized that versatility in her Striper menu. With the three different Striper preparations, she succeeded in presenting three very different experiences of the fish. The first course was a Striper Crudo, with summer truffle, hakurei (a type of turnip), and pickled chanterelles. This was my favorite dish of the night, a fresh delight of textures and flavors. The striper flesh was delicate and firm, clean and fresh, like a fine sashimi. It was enhanced by the subtle earthiness of the truffles and the pickled chanterelles added a tasty acidity. A perfect summer dish which showcased the fish in the best of lights. If you see this dish on the menu, definitely order it! Next up was a Striper Minestrone with lobster, haricot, & basil. A hot soup during the summer is sometimes out of place, but this dish worked, especially as the broth was lighter and it contained seafood. With a strong, savory taste, the minestrone was delicious, spiced just right. It was also an interesting new preparation for the striper, very different from the crudo. As a more traditional presentation, the third course was Pan Roasted Striper with cabbage, coriander, and poblano cream. The thick piece of striper was tender and moist, with large flaky pieces of white flesh that nearly melted in my mouth. And the crispy skin atop the fish was a special delight. Fresh fish, prepared so simply, can be amazing. For dessert, there was a Mascarpone Mousse with peach, raspberry, and fish-shaped ginger cookies, created by Pastry Chef Katie Hamilburg. Light and creamy, with fresh fruit, this was an excellent, lighter ending to the meal. The cookies were a cool addition to the Striper theme, and they were crisp and light as well, with a nice ginger flavor. Overall, this was a compelling dinner, showcasing a few different ways how Striped Bass, which is tasty, sustainable & healthy, can be prepared. Chef Johnson's culinary skills make 80 Thoreau a suburban restaurant worth checking out, but make sure to make reservations so you don't miss out. Concord, for many reasons, is a great place to visit and you won't go wrong by choosing to dine at 80 Thoreau. Today, the temperature in the Boston area is likely to reach at least 90 degrees and the humidity will be quite high. People generally know that they shouldn't leave children or pets in a car on a hot day, though recent news reports have shown there are at least a few stupid people who can't seem to grasp this simple concept. A child or pet can easily die inside a hot car, within a short time period, so it is vital that this should never be done. We don't want any such tragedy to occur. Though it is a much less serious matter, there is something else you shouldn't leave in a hot car: wine bottles. Subjecting wine to such extreme heat is torture, and it can adversely affect what's inside the bottle. Do you want to lose your wine due to the heat? Don't do it! Summer is the time for travel, and maybe you'll visit a wine shop or winery. Or you might just be shopping locally and purchase some wine. You might transport the wine in your car trunk and it could sit there for hours, or even longer. You might not realize that your trunk can get very hot, thus subjecting your wine to intense heat. Your wine though needs protection from such high temperatures. When I travel, I often bring my wine case (pictured above), which is insulated and holds a dozen bottles of wine. Thus, I can safely transport my wines and it has been invaluable on long trips. You don't need to purchase such a case, though if you often buy wine it can be a good investment. But, carrying some other type of insulated bag, box or other container can be just as good. 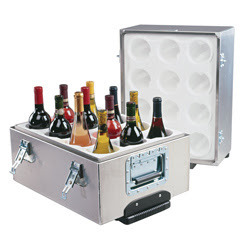 You need to protect the wine from the heat, keeping it at a cooler temperature. An insulated container has other uses too if you travel. You might find some food you wish to take home, and that too can be protected on your long drive home. How many times have you stopped at a farmer's market or food shop, and wanted to buy something but worried about it surviving the journey home? An insulated container will resolve that issue so always keep one in your trunk. It is an easy solution to a rampant problem. Save the wine bottle from the heat, so that you don't come home and find your wine is no good.